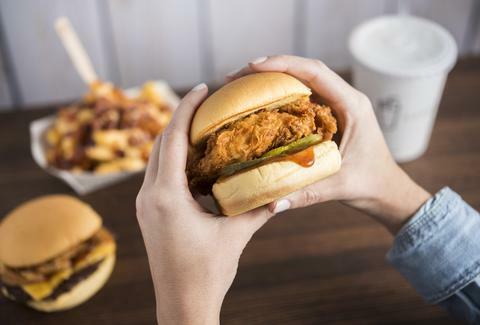 Shake Shack has only offered a few versions of its popular fried chicken sandwich, the Chick'n Shack, since first introducing it nationwide about a year ago. But now, the better burger chain is gearing up to unleash a major new take on the game-changing sandwich as part of its upcoming BBQ lineup. The new sandwich, aptly dubbed the BBQ Chick'n Shack, is delightfully simple: a crispy fried chicken breast, BBQ sauce, and pickles -- on a bun. 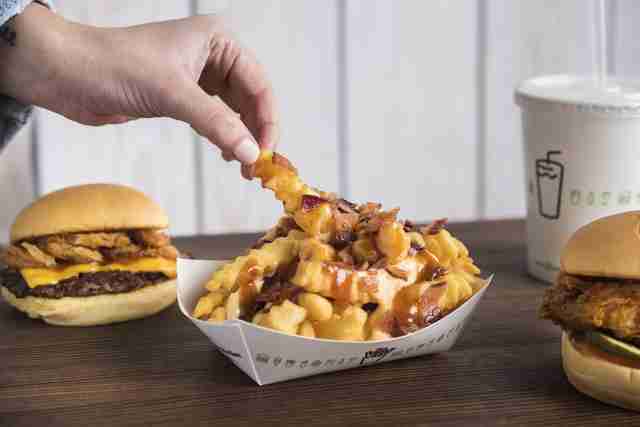 It's just one piece of Shake Shack's BBQ menu, which also includes a BBQ ShackMeister Burger and BBQ Bacon Cheese Fries. All three will arrive at Shake Shack locations across the country (except for ones in airports, ballparks, and stadiums) for a limited time on February 7th, according to a press release. The key to the BBQ menu is Shake Shack's new BBQ sauce, which has been in the works for a while now, according to Mark Rosati, Culinary Director of Shake Shack. “Our Shack BBQ sauce takes inspiration from a few of our favorite regional BBQ styles, from the thick and rich tomato-based Kansas City style to the tangy South Carolina mustard style, and adds wonderful flavor to our new burger, chicken and fries," he said in a statement. Shake Shack describes the BBQ ShackMeister Burger as an angus beef cheeseburger topped with crispy shallots marinated in its ShackMeister Ale and Shack BBQ sauce. As for the BBQ Bacon Cheese Fries, think of the chain's famous crinkle cuts, but topped with bacon, BBQ sauce, and cheese sauce. Sure, adding BBQ sauce to a burger or chicken sandwich isn't exactly revolutionary, but hey, you'll probably line up for 'em anyway. Or you can just go grab the free cheeseburgers Shake Shack's giving away. Tony Merevick is Cities News Editor at Thrillist and is inspired to eat more BBQ in 2017. Send news tips to news@thrillist.com and follow him on Twitter @tonymerevick.